Iranian teachers and educators held nationwide strikes and sit-ins for the fifth time this year, on Sunday, March 3, 2019, upon a previous call. 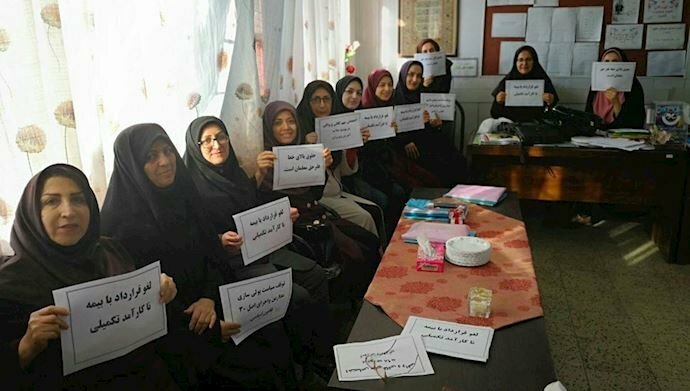 The nationwide strikes and sit-ins have taken place in 31 cities of Iran so far and are currently spreading with more hardworking Iranian teachers and educators joining the protest movements. Female teachers and educators have played an active role in these strikes and sit-ins. Teachers and educators have refused to go to classrooms and have stayed in the school offices to protest the current status of their livelihood and living below the poverty line. Iranian teachers are also demanding the release of imprisoned teachers, the removal of all legal barriers for free guild union activities, the suspension of school monetary policies, the allocation of adequate and sufficient resources for education in the 2019 budget plan, the increase in wages, and the cancellation of contracts with ineffective supplementary insurances. Tehran, Isfahan, Tabriz, Jolfa, Ardabil, Shiraz, Buin Zahra, Mashhad, Babol, Iranshahr, Najaf Abad, Sari, Shahreza, Qorveh, Takestan, Mohammadiyeh Qazvin, Muchesh Kurdistan, Urmia, Nishapur, Ziviyeh, and Falavarjan. In addition to the protests, students joined the sit-in in support of their hardworking teachers. In Hamadan, students joined the strike and sit-in in solidarity with their teachers. Iranian teachers and educators had held nationwide protests, strikes, and sit-ins on four previous occasions in the months of May, October, November, and February. Female teachers had extensive participation in these protests and strikes. Women also got arrested in the wave of crackdown on teachers in the aftermath of the second round of their protests in November. Teachers’ salaries in Iran are one-third of the poverty line, but most of the teachers are on temporary contracts and they receive even smaller wages, less than one-fourth of the poverty line.